Small businesses know by now that they need a website AND visibility in the popular social media sites like Facebook and LinkedIn, and maybe Twitter, YouTube, and others too. So most of you have got at least one social media profile kinda sorta thrown together, like a basic LinkedIn profile. But then I hear: uh, what, huh? What now? Here are some tips. You’ll get a big boost for your business’s visibility if you are listed in a few key places on the web. You don’t even need a website yet. You can get found now. I know, there are zillions of options for online business listings, with a wide range of prices. Many good ones are free but which ones are worth your time? Here’s my cheat sheet for you, based on my years of real-life experience with many types of local businesses. If you have something to say or promote (e.g., looking for work or new clients), making a short and simple video should be moved up on your priority list. When you see how this small business video sample (featured here) draws you in, you’ll want one too. YouTube is the second most popular place to search, after Google. We’re all so worried about our rank in Google, but what’s your rank in YouTube? Does Web Marketing Ever End? One of my web marketing coaching clients asked me this question that comes up so much that it was worth a blog post. Do I have to learn Twitter now? Please, let there be an end to this web marketing! I am walking away from the computer now…walking…farther…away. Back in the day, a business needed to be listed in the Yellow Pages if you wanted to be found, but now everyone searches online. However, most small businesses, especially service professionals like coaches and healers, are not easily found online. But you CAN be found, much more easily than you think, with some simple steps that are free. Make sure you’re found in the primary online business listings. Google is the new Yellow Pages. 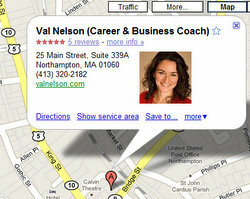 Google offers a free and easy way to include your business in their search results. It’s designed for local businesses, but it works even if your clients are beyond local. You don’t have to have your address shown publicly.